← My dad got married! So my 8-year-old had to do a book report on a science fiction book, and he picked Ender’s Game. I really thought Ender’s Game was too tough a book for him, both in terms of reading level and in terms of content, but he was certain he could handle it (“Seriously, Mom! I already read page 1!”). Just in case, I put Jacob Wonderbar on hold at the library. 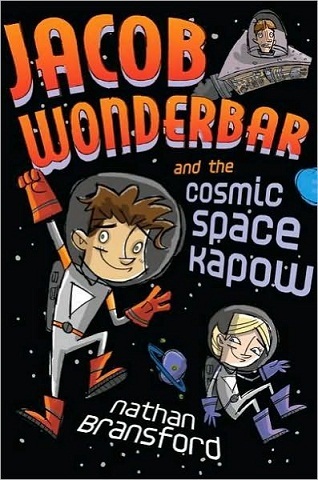 When a week went by and he’d only made it to page 4 of Ender’s Game, I picked up Jacob Wonderbar. My son knew he had to switch books. Ender’s Game was indeed too hard, but Jacob Wonderbar was unappealing to him for two reasons. One, I’d picked it. Two, it represented his failure with Ender’s Game. So finally one evening I picked it up and started reading it to him. He settled down and prepared to hate it. But within the first couple of chapters he laughed out loud twice. When I finished those chapters, he insisted I read a third, and a fourth. When I refused to read further that night, he stayed up late reading the book himself, coming downstairs every so often to update me on the book’s events (“Mom, they broke the universe!”). This morning I couldn’t drag him down to breakfast until I told him to just bring the book with him and read it while he ate. He’s still reading it now as I type this blog post. He wants me to tell you guys he’s on chapter 30. I’ve only read the first four chapters myself, so far. It’s such a boy book. The main character is a troublemaker at school who is facing down an evil substitute teacher. The science fiction parts seem to come later. I can’t tell you a whole lot about it myself, only that it seems to go over really really well with 8-year-old boys! I love his reaction. He’ll probably remember that book for the rest of his life. I’ll keep it in my mind for my grandsons. Got a ways to go before they’re eight, there’s a lot of them! Maybe I should start a bookshelf on Goodreads, titled “books to give as gifts!” Can’t trust my memory for five years! His enthusiasm was really cute. Later, after he finished the book, he was bragging about how fast he read it. I’ve got a few kids in mind I’m planning to give it to for Christmas now. Good boy books are rare finds!